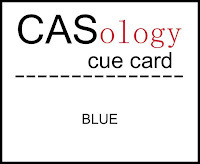 Are you ready for this week's CASology Cue Word? I decided to go with a blue sky, in fact in the winter there are some of the most beautiful and vivid blue skies. I wanted to make the hot air balloon the focal point where you will see nothing but blue skies. I added some foam tape to the back of the balloon to draw your eye there. Once I sketched out my card I immediately thought of the song, are you singing it now? I typed the line from the song using the Clipper Script font off the Internet and then printed the card base before stamping the muted clouds in the distance. The hot air balloon was die cut and coloured with Copics. 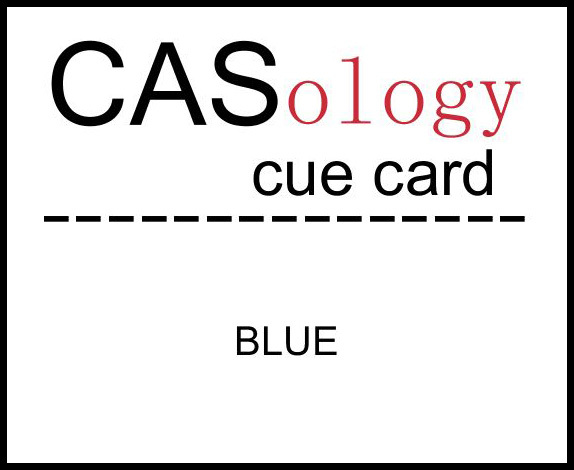 So here is my blue card. I can't wait to see what BLUE means to you! A Lovely Classy card I love the sentiment and the simplicity of it . Gasp...I LOVE it! Perfect idea! Your stamping on that teeny die cut is perfect too! Oh now THIS is perfect for the cue word! I just love that little balloon and yes your song is officially in my head!! 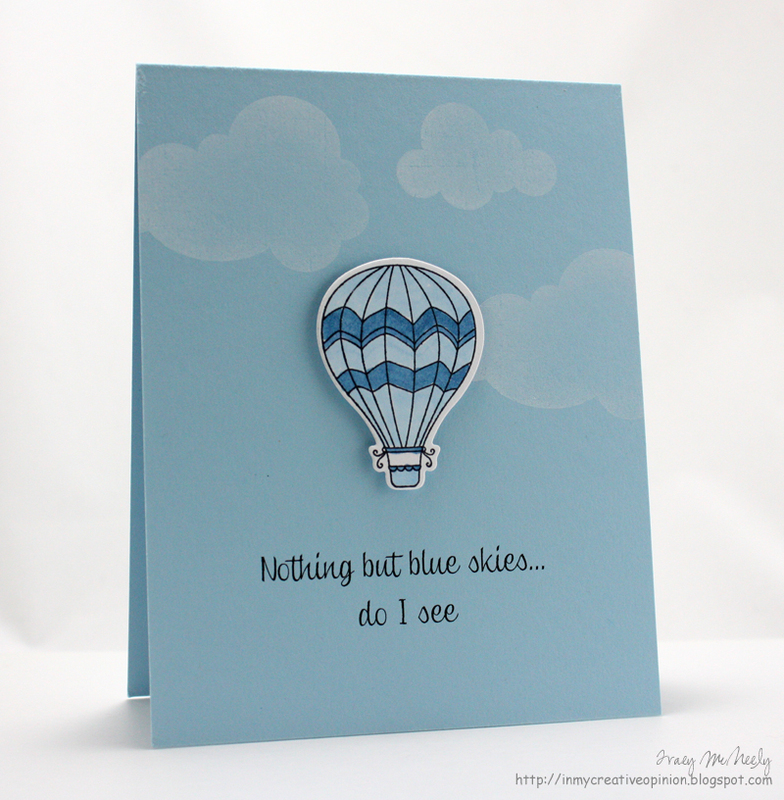 your card is fantastic, tracey... love the subtle stamp of the clouds and that cute hotair balloon! Perfect blue confection, Tracey, and perfect song to go with it!! This is the most AMAZING card--and SO perfect for the challenge! Love how you used part of the song for your sentiment--but now I just need to get it out of my head!! Beautiful blue card Tracey! I made mine up so fast. We are so cold here and you are the opposite , we have sun but just so cold for what we are used to. Oh yes....I'm singing! Your card is wonderful. I love Tuesdays because I know you'll be popping in with awesome CASology and ColourQ cards and today is no exception. Love this card! I love that blue sky you created :) And what a perfect sentiment! Oh, Tracey, what a great balloon amidst the clear blue skies! Great take on the cue word this week! What a great use of that balloon stamp. One of my faves, and I love how you colored it and added your own sentiment. Call me dense, but I don't know what song this is from. Is it perhaps Canadian? Aw, this is perfect for the blue challenge! I love your sentiment!!! Cool treatment for the clouds! Love all the blue...seems the fitting color for January! :-) This is a happy card and I love the balloon lifting right off the page! Gorgeous card. Love the simplicity of it. Those muted clouds really highlight the hot air balloon. Love that sentiment! The balloon and clouds are one of my favorite PTI sets! 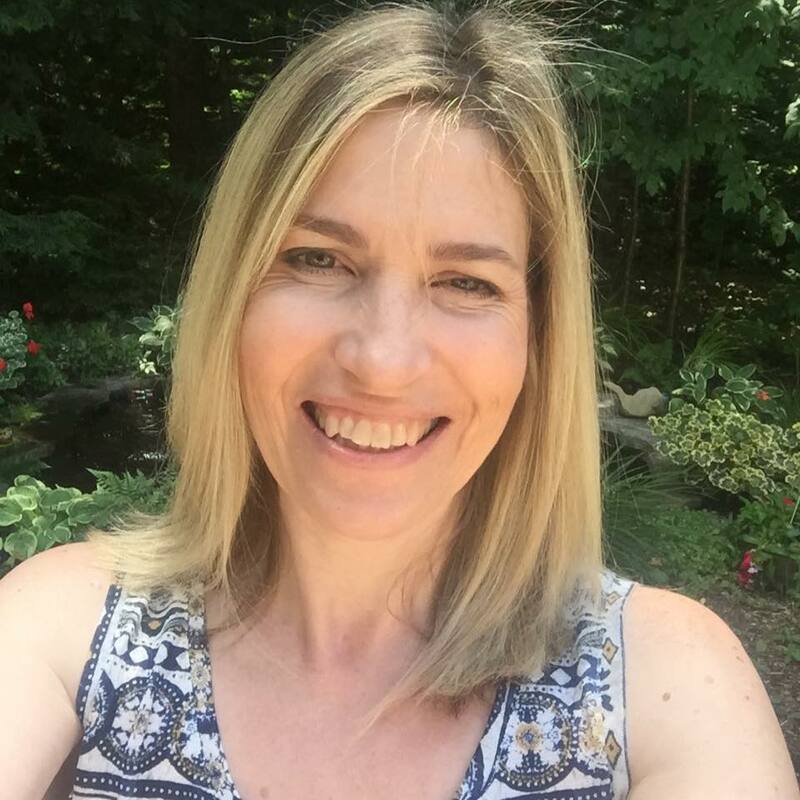 Love what you created! The sentiment and blue card go perfectly together ~ another fantastic card! Gorgeous blue all around! Love that sweet hot air balloon!